Do you want to find (and keep) more customers? Whether you’re a small business or a big business, there’s a simple solution to engaging and retaining your customers more effectively — video. When it comes to video marketing, both conversion and engagement rates for this type of content are much higher than other forms of media, such as text or images. Today, 93 percent of marketers are using video content in their marketing campaigns, according to a ReelSEO Video Marketing Survey and Business Trends Report. Are you? Here’s why your business should be utilizing video marketing. 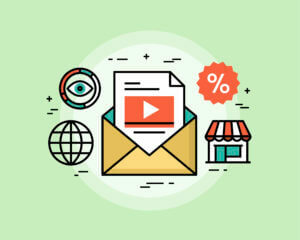 Including the term “video” in an email subject line increases the open rates by 19 percent, according to data reported by B2B Marketing. Additionally, including the word increases click-through rates by 65 percent and reduces the amount of email unsubscribers by 26 percent. Take a cue from the marketing experts from Litmus. Litmus earned a spot on Campaign Monitor’s list of the 100 best email campaigns, a big honor considering that there were more than 4 million email campaigns sent out via Campaign Monitor. So what made this company’s email campaign stand out from the millions of other marketing campaigns? It used video. It’s hard to ignore the massive popularity of YouTube. But the online video-sharing website isn’t just for fail videos and cat clips. Businesses and marketers are turning to YouTube to share their message. But marketing professionals aren’t posting ads, they are posting stories. For example, a video from Amway tells the story of the company, highlighting its values and history throughout the 30-second clip. Smart marketers are avoiding the salesy ads and instead are creating compelling stories to achieve success online. There are more than 400 million monthly active users on Instagram, according to the app’s press page. The photo and video sharing social media platform is an untapped marketing tool for many of today’s small business owners and big businesses alike. However, social media-savvy companies are taking to the app to tell their story and engage customers. Recently, Instagram unveiled a new feature that allows users to post videos that play for up to 60 seconds, compared to the former 3 to 15 seconds. And smart marketers are jumping on it. One company finding success on Instagram is Ben & Jerry’s Ice Cream. One single video posted to its Instagram gained more than 21,000 likes and a total of 3,573 comments. But its video doesn’t come across as an ad. The content of the video shows users how to make cookie cup sundaes and provides a link to the full video on the Ben & Jerry’s website. Data reported by Gallup shows that customers who are more loyal and attached to their favorite brands bring in 23 percent more revenue to the company. Making your audience feel recognized can do wonders for your business. Take Dove, for example. Many of its video marketing campaigns invoke a powerful emotional response. The brand does a fantastic job at crafting stories and encouraging its audience to take part in the stories. Think about how you could use video to better engage your customers. What examples of engaging video have you enjoyed and found effective?